It’s all too easy to rack up debt – credit cards, HECS, car loans – and may seem all too hard to pay it off. Debt can also have a big impact on how much money you can borrow for a home loan, so reducing your debt is essential when you set out to buy your first home. Here are seven steps you can take towards minimising your debt and moving into the property market. Create a spreadsheet and track your expenses for a month – record everything so you can see where your money is going. You may be spending much more than you think on some things – more than you can really afford. With a clear idea of how much you spend each month, you can figure out how much you really need to spend, and where you can cut back. That second coffee every day could be costing you $20 a week – that’s $1,000 a year. Buying your lunch rather than bringing it could cost you $2,500 a year. Buying one less bottle of wine a week could save you another $1,200 a year. With a bit of commitment, you can rein in your spending and have more money to repay debt. The only way to get on top of your credit cards is to stop using them. Make a budget for the money you need to spend each week or fortnight, based on how much money is coming in and what your necessary expenses are, and stick to it. Calculate how much is left over after you’ve paid for the necessities, then figure out how much you want for discretionary spending and how much you can put towards repaying debt. Also, put money into a contingency fund to cover unexpected expenses such as car repairs that could bust your budget and cause you to reach for the credit card. Work out how much money you actually owe on credit cards and loans – you may not realise how much it is. When you know how much debt you’re in, you can think more realistically about repaying it. You need to pay at least the minimum amount due on all credit cards each month to avoid going backwards and in some cases being charged fees and penalties. But by paying only the minimum, you may never get the cards paid off; you need to pay more to make progress. 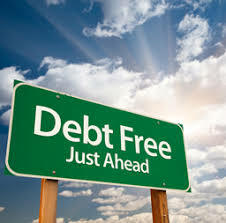 paying smaller debts first to give you the sense that you’re getting ahead, and that paying off debt is possible. Armed with your budget and having worked out your debt priorities, you can plan which debts you will pay off over what period of time. Having a plan will increase your sense of control over your debt; sticking to it will increase your sense of achievement. The thought of paying off all your debt may seem daunting, so breaking it down into milestones will help you see the way ahead. Set goals such as paying off 10%, then paying off 25% and so on. Remember to celebrate each time you reach a milestone – buy yourself lunch or go to a movie as a small reward for your achievement. Keep going with your repayment plan. If you miss a payment because of an unforeseen expense, stay positive. Avoid feeling demoralised or derailed by looking forward to the next debt milestone – you can get there. Call Gail or Terry today.